Seriously, though. Tile — whether it's used as flooring, in the kitchen as a backsplash or for counters, or in the bathroom — has one great downfall: grout. Since grout is porous in nature, unsealed grout absorbs all kinds of stains, from mildew to coffee and everything in between. To say it's a headache to keep grout clean is an understatement. We inherited marble tile counters when we purchased our home. It's pretty clear that the grout was never properly sealed, so it soaks up stains like crazy. It makes our kitchen feel gross and grimy, even if it was just cleaned. While I'd love to replace the counters with a solid surface like quartz, it's just not in our budget — plus, we just can't justify getting rid of something that's perfectly fine otherwise. So instead, I've come up with a fool-proof method to get grout sparkling clean and all it takes is a few items and a lot of elbow grease. 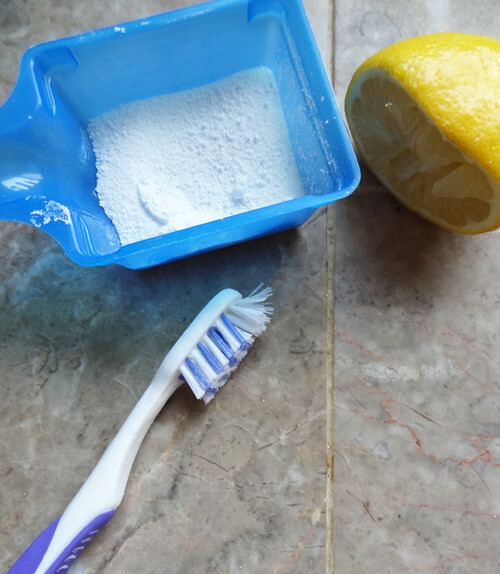 Check out the full post over at Houzz to learn the easy method for yourself and be on your way to clean grout....finally! So what about you guys? Have any easy methods to get those tough to clean areas sparkling? I'd love to hear about them in the comments section! Disclaimer: As a Contributor for Houzz, I have been compensated for any Ideabooks featured on Houzz, although I am not compensated for sharing Houzz Ideabooks on Revamp Homegoods. All opinions expressed here are that of the writer and are in no way influenced by Houzz.